Naagrik”. UDAN is an innovative scheme to develop the regional aviation market. UDAN is a market-based mechanism in which airlines bid for seat subsidies. 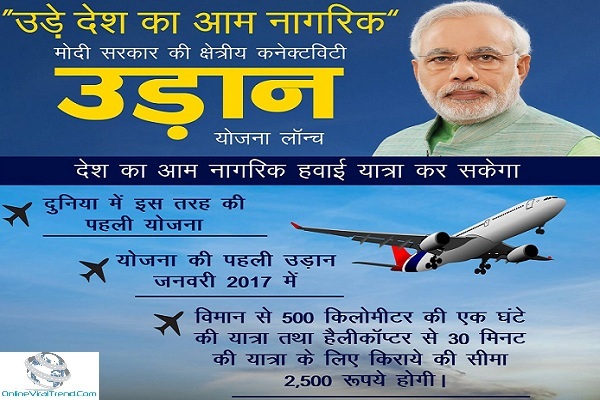 This first-of-its-kind scheme globally will create affordable yet economically viable and profitable flights on regional routes so that flying would be affordable to the medium class Indian people who belong to small towns. The scheme would be in operation for a period of 10 years. The scheme UDAN will provide a win-win situation for all stakeholders. The citizens would find more job opportunity and will be also benefited of affordability, connectivity and more jobs. The BJP Govt would be able to expand the regional air connectivity and market. ii) It will ask airlines to pay Rs. 8,000 every time they land at an airport in a major city or metro.